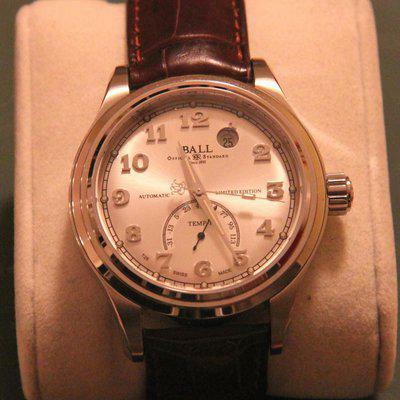 FS: BALL Trainmaster 60 Seconds Watch –Vintage Style—Original Version, Black Dial--NICE!! Posted by timefleas in forums.watchuseek.com May 31, 2018, 9:16 a.m.
May 31, 2018, 9:48 a.m.
BALL Trainmaster 60 Seconds, NM1038D, on BALL Croc Strap, BALL Deployant, Boxes!! This watch is the first generation (preferred by many) of 60 Seconds series. It has an extremely well engineered, very detailed dial design and is consistent with the recent trend towards smaller watches after surviving the era of hockey pucks on a wrist. The watch still runs within its original tolerances (which was oddly specified by Ball at the time of manufacture to be +/- 26 seconds per day)—it should run fine. There are some wear marks on the polished case, as to be expected (nicks, dits and swirls--nothing significant)—check the pictures. Overall, this is a very rare version of this watch (the white dial is much more common), and is much preferred over the larger and busier “II” version (I’ve owned both). Truly a beautiful piece of Ball engineering. Comes with Ball box set, watch, Ball croc strap and Ball deployant (described below) as shown—nothing else! Case: Solid Stainless steel with a combination of satin/polished finish (mostly polished). Lume: 15 tritium tubes on hour, minute, second hands and dial for great night reading capability. Strap: OEM BALL crocodile, so well used that the markings for Ball are all but gone on the underside, BUT the upper side (the one we see) is actually in very nice shape, and has lots of life left. Included is the accessory BALL Deployant Clasp (worth at least $150 by itself): Butterfly style, center opening, Ball “RR” Logo engraved/embossed. My price is $650 of Best Reasonable Offer (starting low, so not a lot of wiggle room here). The final price covers all costs, including free and insured EMS shipping, with tracking. Shipping is via EMS, includes tracking and insurance, and is FREE with purchase price. US customs just about never assesses any fees for used watches under $5,000, so there should be no problems in that regard--based on experience--however, if any fees were to be incurred, they likely would be quite minimal but would be the buyer's responsibility. Based on past experience, shipping is often quicker AND safer than standard domestic delivery services. I have great feedback, with extensive experience shipping watches to anywhere in the world with ZERO PROBLEMS to date. Please search "timefleas" in the Watch Deals section. Let me know if you have any questions. This watch is guaranteed authentic and comes in excellent cosmetic and working condition (with issues, if any, duly noted, above)—please review the pictures carefully as they are part of the description. I cannot guarantee time accuracy for watches other than to say that they were working fine and are guaranteed to run. Keep in mind that the process of shipping can sometimes affect the timing/accuracy of watches, and they may need to be adjusted upon receipt. As such, though they likely will not require it, I recommend that all used automatic watches be serviced upon receipt. The watch has not been tested for pressure or water resistance. PLEASE ASK ALL QUESTIONS BEFORE PURCHASING OR MAKING AN OFFER. Very good communication, watch is exactly as described. Shipped the same day after payment, arrived in 2 days despite of the big distance. Recommended seller! Just received watch from timefleas shipped from Japan very fast and well packed. no issues and good communication buy with confidence from him. Timefleas is a great seller! Bought a barely touched Sinn 556 from **timefleas** off the Sales Forum. Excellent transaction in all respects - quality seller who knows how to communicate and make arrangements. Shipping was fast and to my specifications , Highly recommended!